From next month, three new four-port USB hubs are going to be available from T rust. Hubs aren’t exactly the most exciting gadgets in the world, but these ones at least look nice in blue, pink or red. 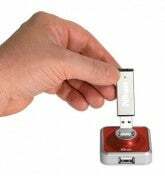 The Trust USB 2.0 Micro HUB is £11.99 and for more information, visit the Trust website.